Phenotypically attractive and thick-made with extra capacity and outstanding structural integrity. 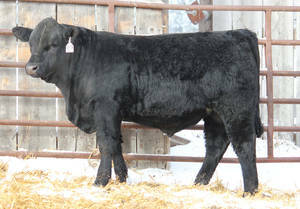 His mother is best known as the dam of MAC TOPEKA 159T, currently one of the most widely used bulls in the Salers breed. ZONE ALARM weaned off with a ratio of 107 and his dam has an average weaning ratio of 104 on her 6 calves.